Midnight blue satin ribbon and pearlescent ivory card. Royal blue satin ribbon and white linen card. Perfect if you have lots to tell your guests! Ivory satin ribbon and white linen card. Perfect if you have lots to tell your guests! Royal blue satin ribbon and white linen card. This Collection is absolutely stunning and will certainly 'wow' your guests. Wide, satin ribbon finished a gorgeous oversized crystal brooch, this is the ultimate in elegance and sophisication. Many brides also decide to put their invitations into a luxury presentation box to give it even more of a 'wow' factor! The design can be slightly altered, as can the ribbon and embellishments (there are lots to choose from!). All the stationery is printed and mounted on luxurious 300gsm card, with a selection of finishes, which adds to the luxury 'look and feel'. Stationery is printed on 15 x 15 cm when flat or folded, unless detailed below, and comes with an envelope. 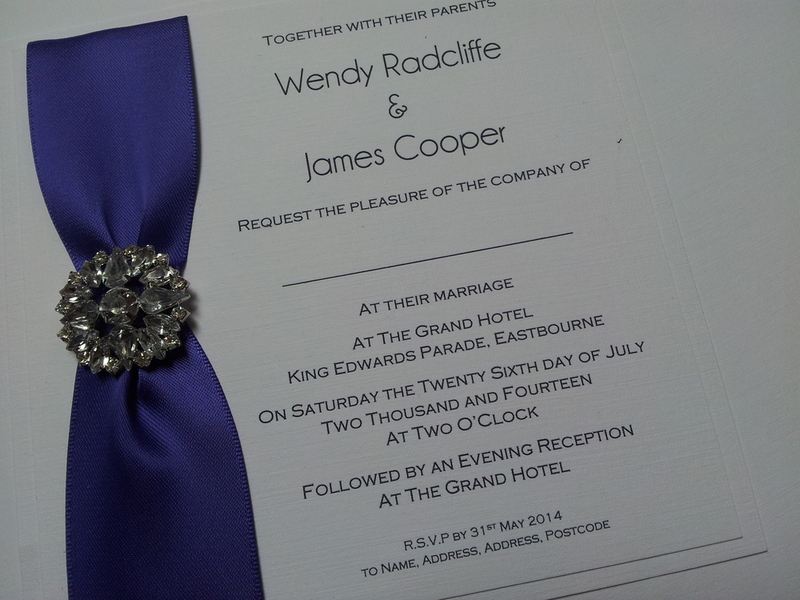 Invitations are available in many different options: flat, classic, pocketfold or wallet style. 53 ribbon colours to choose from.